Like most kids, my boys love when I make anything rainbow, like this rainbow cake and these rainbow (tie dye) cupcakes. They didn’t care for my rainbow detox soup at all though hahaha. 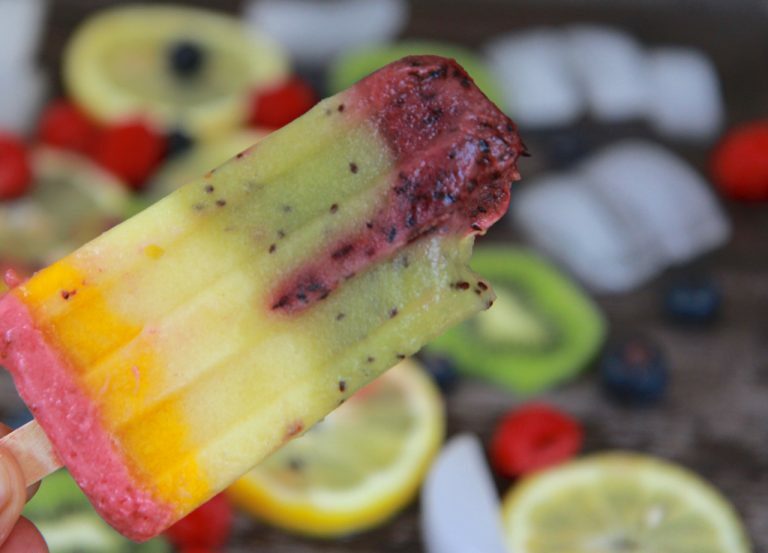 I knew that when I made these rainbow smoothie popsicles that they would be a hit. 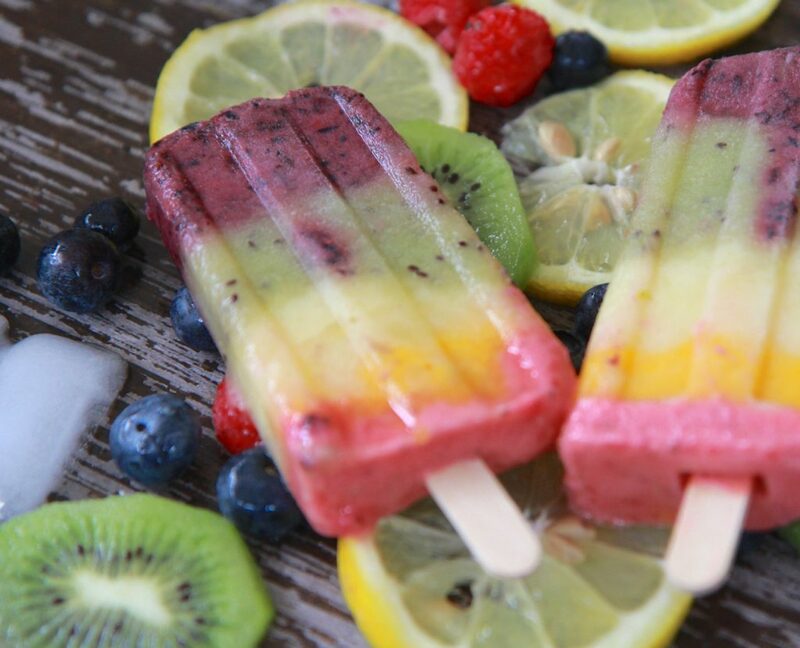 We love smoothies around here and that’s exactly what these popsicles are, frozen smoothies! 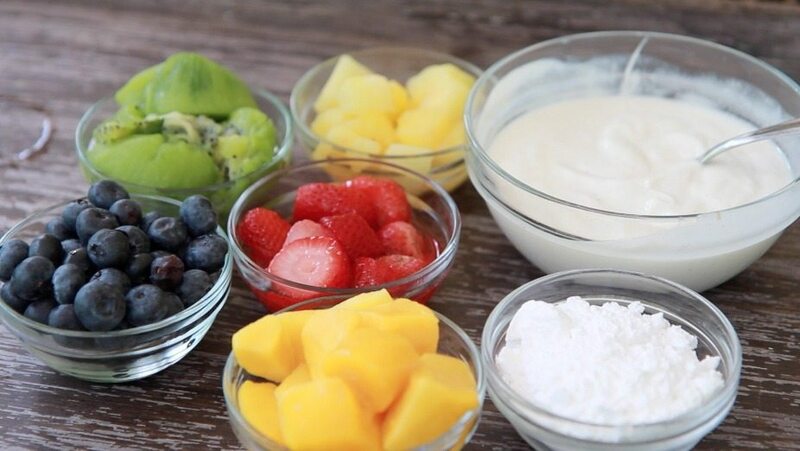 Hey you just can’t go wrong with fresh fruit and yogurt for a quick snack or breakfast. Sometimes I even add in some creamy oatmeal for some extra bulk. 1.) You really can’t go wrong with this recipe. I’ve listed some measurements below but really you can use as much fruit and yogurt as you’d like. I prefer to use more fruit since it creates a darker color. Most smoothie pop recipes calls for equal parts fruit and yogurt. Do what lifts ya skirt! 2.) ADD SUGAR or use ridiculously ripe fruit: I know what you’re thinking. “Who needs added sugar, I never add sugar to my smoothies” Well, neither do I, but as with anything that’s frozen, it doesn’t taste as sweet. Hence why melted popsicles takes so syrupy sweet, yet when they are frozen the sweetness is perfect. I always over sweeten a tad for this exact reason. 3.) Use fresh fresh or thawed frozen fruit: Anytime I’ve tried to make this with frozen fruit I have to add a bit of fruit juice to get the fruit to blend properly. And then with the added fruit juice the layers just don’t seem to stay separated. 4.) Want a creamier texture? Try blending in some banana! Tastes great with all the other fruits as well. 5.) Swap out the fruits for your favorite. No need to stick to what I have listed. Instead of mango you can choose peaches, instead of kiwi try spinach. Don’t like blueberries? Try blackberries or raspberries instead of strawberries. 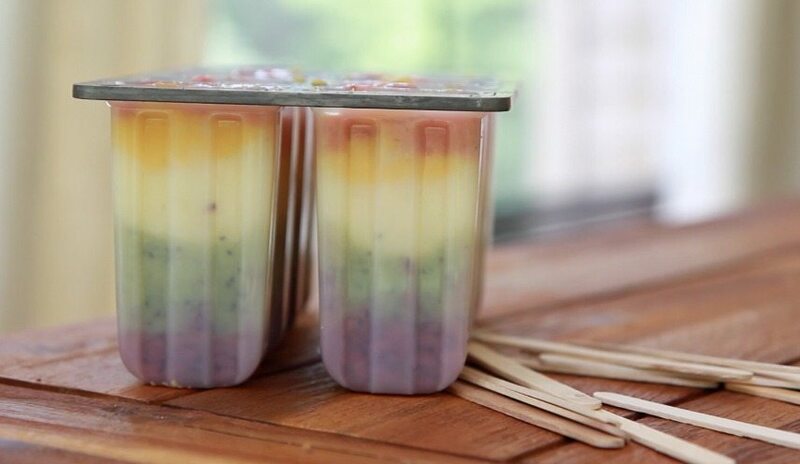 Watch me make these Rainbow Smoothie Popsicles from start to finish! Add blueberries to a small blender. Add in up to ½ cup of yogurt. Once satisfied with the taste spoon a spoonful in each popsicle mold. Repeat with the rest of the fruit, one at a time, ( Blending in up to ½ cup of yogurt, sweetening with powdered sugar and then spooning in each layer.) Rinse the blender out after each fruit. To remove popsicles, run the base of mold under warm water. Enjoy as a quick breakfast or snack! *I love blending my yogurt with banana. Banana goes great with all of these flavors and it gives the popsicles a really creamy, ice cream like texture.